As all of us prepare to attend NAFSA's 70th Annual Conference & Expo in Philadelphia, we invariably begin to organize our calendars, set up meetings, and prepare for one of the most dynamic weeks over the course of any given year for many international educators here and abroad. This certainly includes preparing for and making time to attend all the plenaries. I am particularly excited this year that we will have the opportunity to hear from scientist and best-selling author Bill Nye on Wednesday, May 30. The moment you learned that Bill Nye (yes, The Science Guy) would be one of our speakers, you may have wondered how he relates to international education. Then after a few very brief moments, I am sure that you made the connection (a connection made by SCIENCE!). For a generation, Nye through his widely seen television show reinforced and promoted early science education in the living rooms of an entire population of youth through his tireless enthusiasm and deep-rooted belief in empowerment through curiosity and problem solving. Early science education contributes to demystifying the wonders of science resulting in a stronger foundation for students to learn, pursue advanced studies, and understand the interconnectivity of our world. Nye also recognizes that knowledge and understanding through evidence-based learning is empowering to all. He is committed to championing the value of science, whether that is through developing a firmer grasp of how things work or how our actions affect our environment and our planet. Through his familiar yet impactful approaches, Nye democratizes the learning of all things science to everyone, regardless of socioeconomic background, gender, or age. He deeply understands the value of how scientific literacy results in a more educated society, a more competitive global workforce, and a more enlightened world citizenry. All of these are goals that each of us as international educators aim to help achieve. At NAFSA, the goal of our conference plenaries is to provoke thought. It is to teach. It is to inspire discourse and dialogue within our profession and beyond. In the final analysis, they are to provide moments for the international education community to connect the dots between all facets of life as we develop and strengthen responsible opportunities for our diverse stakeholders in the increasingly complex higher education landscape. Nye encourages us all to be the change we want to see in the world through a "shared commitment." That is precisely the reason for which many of us have pursued this profession in the first place. 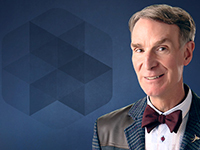 I look forward to hearing Bill Nye share his thoughts with all of us. Joël A. Gallegos is assistant provost of international programs at the University of North Carolina (UNC)-Charlotte. He serves as a Member at Large on the NAFSA Board of Directors.